When you are composing a send a text action that has been added off a keyword received or opt-in form submitted goal, you will need to decide whether contacts that are not already subscribers will follow a single or double opt-in process. In this article, we will explain the difference between a single and double opt-in process, and how country laws and regulations affect which opt-in process you should choose. 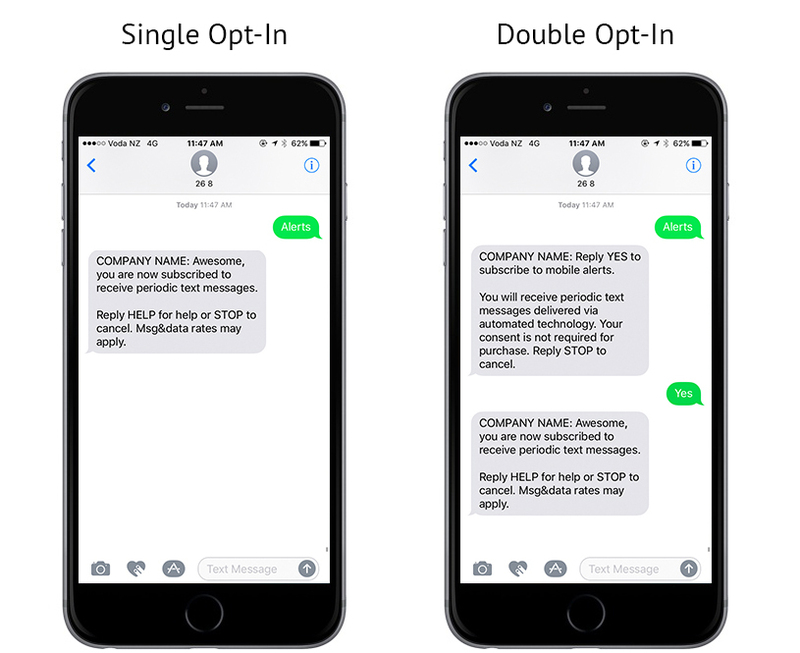 The main difference between single and double opt-in process is whether or not a contact has to confirm that they would like to receive text messages after their initial opt-in request. In a single opt-in process, contacts become subscribers and receive a confirmation text as soon as they text in a keyword or submit an opt-in form. They do not need to confirm their opt-in. In a double opt-in process, contacts need to confirm they would like to opt-in to receive text messages from you. When a contact texts in a keyword or submits an opt-in form, they are sent an opt-in text which they must reply YES. Their opt-in status will be set to unconfirmed until they reply YES, at which point they will become a subscriber and receive the confirmation text. When it comes to choosing an opt-in process, you need to consider country laws and regulations as text marketing laws and regulations differ in every country. Under a law called the Telephone Consumer Protection Act (TCPA), you must have 'prior express written consent' from a contact before you send them any marketing text messages. When a contacts texts in a keyword or submits an opt-in form, you should follow a double opt-in process and use the opt-in text to obtain a contact's prior express written consent. Click here to learn more about the recommended US opt-in processes and set-up. Regulations set by Canadian Carriers require that you follow double opt-in contacts when they submit an opt-in web form, however, when a contact texts in a keyword, you can follow a single opt-in process. Click here to learn what the requirements for Canadian opt in and subscriber text messages. Unlike the USA and Canada, which sometimes require you to double opt-in contacts, you can single opt-in contacts whenever they text in a keyword or submit an opt-in form.